GUITAR god Joe Satriani is set to cause a shockwave at St David’s Hall on Thursday 5 November for a night of soaring solos and rocking riffs. Widely regarded as one of the most influential and respected instrumental rock guitarists ever, Satriani has produced a stunning body of work across an astonishing career spanning over 30 years. During that time he established himself as that rare “musician’s musican” who crossed over into the mainstream with music that was both sublime and complex, and appealing to a variety of tastes. As a true master of the six-string, Satriani started out as a guitar tutor and even taught the likes of Kirk Hammett of Metallica and the legendary Steve Vai. Yet, he really sprang to fame with his classic album and single Surfing with the Alien, which went platinum and was nominated at the 1989 Grammy Awards for the Best Rock Instrumental Performance. In 2013 Satriani released his 14th studio album, the aptly titled Unstoppable Momentum, which topped the US Billboard Hard Rock charts. He’s also become equally well known for his highly sought after collaborations with the likes of Mick Jagger, Alice Cooper, Deep Purple and Crowded House. Currently he’s the lead guitarist in a supergroup called Chickenfoot alongside former Van Halen members Sam Hagar and Michael Anthony, plus Red Hot Chili Peppers drummer Chad Smith. 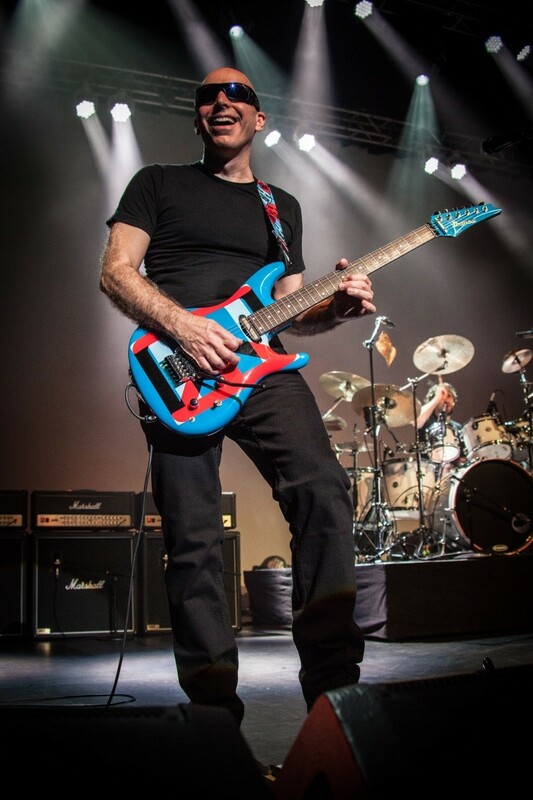 Satriani will not only have you in awe of his dazzling skills across the fretboard, but he’s also a hugely gifted multi-talented instrumentalist on bass, keyboards, harmonica, harp and banjo! Rock out with this genuine guitar hero at St David’s Hall! Tickets are on sale from 10am on Friday 6 February priced £34.50 and £38 (plus a £2.95 ticket service charge per transaction). VIP packages are also available.